legendary dark ambient project by Helge Sten. the physical impulse to dance. mathematics in his digital works. captured and recorded at abandoned spaces in Chernobyl. emphasizing the iconoclastic aspects of music. transcendental aural and optical translation of the economic crisis. opticoacoustic compositions, using digital art as a hybrid tool. Byetone's (Olaf Bender) Audio-Visual perfomances trigger the physical impulse to dance. Ryoji Ikeda utilizes and applies the aesthetics of mathematics in his digital works. Biosphere (Geir Jenssen) constructs arctic ambient soundscapes, by emphasising the iconoclastic aspects of music. Novi_sad (Thanasis Kaproulias) and Ryoichi Kurokawa demonstrate a transcendental aural and optical translation of the economic crisis. Alva Noto (Carsten Nikolai) is a designer of electronic opticoacoustic compositions, using digital art as a hybrid tool. Deathprod is the moniker for the legendary dark ambient project by Helge Sten. Mika Vainio has been characterized as "the monarch of stripped post-technoid sound..."
Thomas Köner focuses on the acoustic and optical nuances of metaphysical landscapes. A graphic representation (in real time) of the global network activity measurement, with information from 193 states. Surround sound installation with synchronized fluorescent tubes. Five electromagnetic grids is a listening station where you can hear groups of electromagnetic recordings made in different metropoles around the world. Audio-Visual installation with material that has been captured and recorded at abandoned spaces in Chernobyl. A day in the life of a reindeer herder brigade in Northeastern Siberia. The Electrical Walks are a public walk where you can detect by special wireless headphones the electromagnetic waves of the city, which usually are not audible. 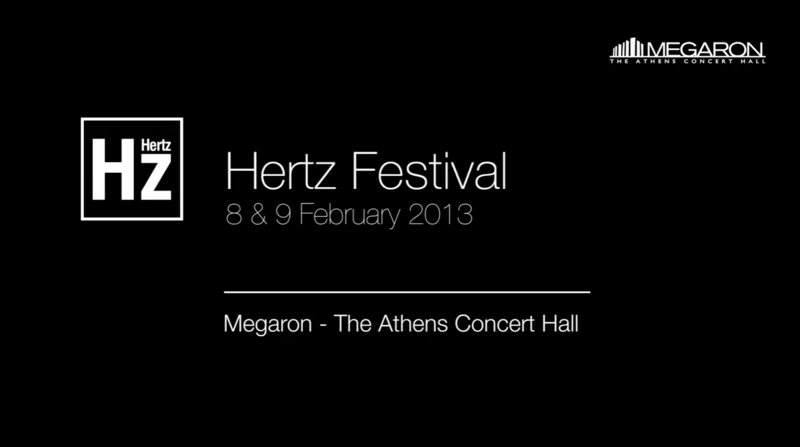 Hertz Festival emphasizes and demonstrates prominent optico-acoustic works, by framing a potent arena of expressive activity. Moreover, Hertz disseminates and transmits innovation in sound and digital arts, by functioning as the absolute counterpoint to the embrace of new cultural and aesthetic techniques. In 2013's edition, taking place at Megaron, The Athens Concert Hall, on 8th + 9th February, we are widening the thematic spectrum of the festival by hosting Audio-Visual performances and installations created, constructed and presented by major figures in the fields of exploring + utilizing new media, towards aural and optical navigation + synthesis. Hertz Festival 2013 operates as a kaleidoscope of expression, taking audiences on a unique and captivating journey – one that is exemplary, intense, multi-textural, vital, ear + eye expansive, fertile and enriching.